Christian pilgrims from around the world have attended mass at the Church of the Nativity in the town of Bethlehem, located at the biblical birthplace of the baby Jesus. 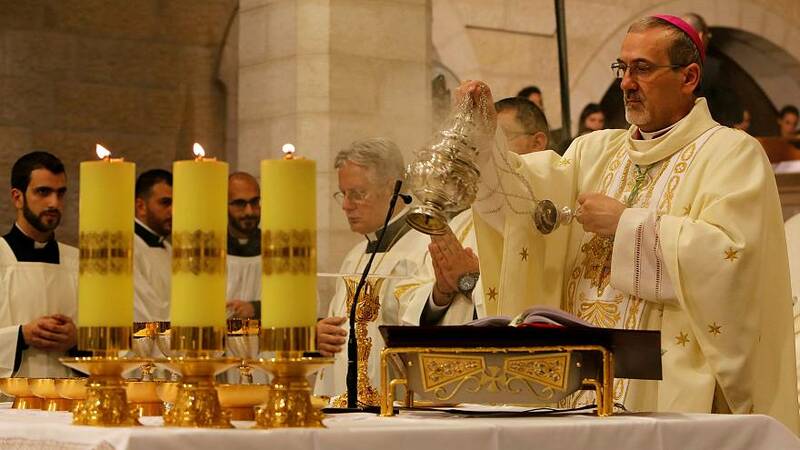 During the ceremony, attended by Palestinian President Mahmoud Abbas, Father Pierbattista Pizzaballa, Apostolic Administrator of Jerusalem touched upon the subject of the holy city of Jerusalem and the United States' controversial recognition of it as Israel's capital during the service. "My message to all those that have the power to decide our future. Today even more than ever, we need from you, from all those that can take decisions on real policies, serious policy." "And despite the many disappointments of the past and of the present days, with determination, do not abandon having a vision.."
Father Pizzaballa called for politicians to have "courage" and "a vision" referring to Jerusalem as a place to be "served" and not "possessed". This year fewer people than usual were in the West Bank town because of the increased tensions between Palestinians and the Israeli army since the US President's decision. Banners bearing messages protesting Donald Trump's decision were hung in front of the church. President Trump abandoned decades of US policy on December 6 and said he would move the American Embassy to the holy city.